I’m constantly surprised at how much food my kids can pack away. I have a teen, a tween, and two growing elementary schoolers, and when I look at the aftermath of breakfast around here, I’m always shocked at how much food it takes to keep them fueled for the morning. So I try to make sure they have plenty of protein, and good food to keep them filled up and ready for the day. And after school, I try to make sure we’ve got a good, solid snack when everyone gets home from school. This jalapeño breakfast scramble is a tasty way to start the day, and will keep kids full for a good long while. And it’s flexible — throw in whatever veggies taste good with eggs, add some salsa if you have it. You could even serve it up on a tortilla for a portable breakfast burrito. Such is the beauty of the breakfast scramble. Yield: 2 servings unless you are a ravenous teen. Then probably just one. Bake jalapeño peppers according to package instructions. Let cool slightly, and cut in half. While peppers are baking, add butter to a frying pan and melt. When butter is melted, add tomatoes and red pepper to pan, sauteing just until slightly soft. In the meantime, whisk eggs and milk together in a small bowl. 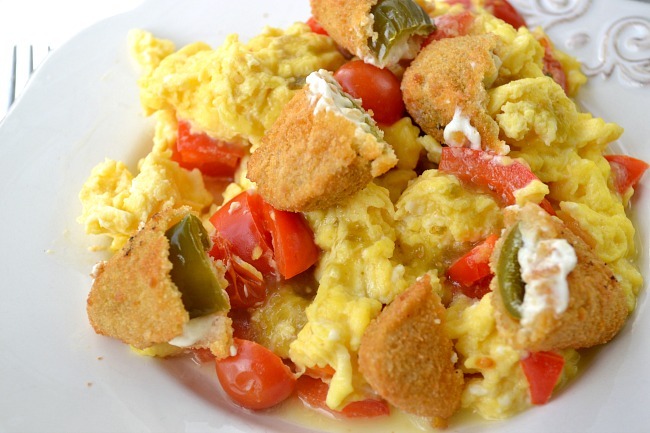 When vegetables are soft, add scrambled egg mixture to the pan and cook. Just before the eggs are done, add shredded cheese and cook until cheese is melted and eggs are done. To assemble, place half the scrambled eggs on a plate. Top with salsa and 4 halves of Farm Rich jalapeño peppers. Serve. When you cut your jalapeño poppers, they may get a little messy, with some cream cheese going all gooey on you. Know what we say to this? We say to this…yassssss! A little gooey mess never hurt anyone and all that cheesy goodness mixed in with the eggs and vegetables…mm. Mmm. I found these Farm Rich jalapeño peppers at Walmart. They’re one of many Farm Rich snacks you can grab, and they’re ready for hungry kids in 20 minutes. Farm Rich snacks are made with real, wholesome ingredients that are good for growing kids. And because they’re ready in 20 minutes, even if I forget to have a snack on-hand when the kids get home, I can have one ready pretty quickly. For more fall ideas, coupons, and recipes, check out the Farm Rich Falliday page, too! And be sure to sign up for the Farm Rich Loyalty Club to get exclusive offers, recipes, and promotions.